Here it is — the second instalment of weekly inspiration. I explained in last week’s post about why I’ve decided to write these posts and what you can expect from them. 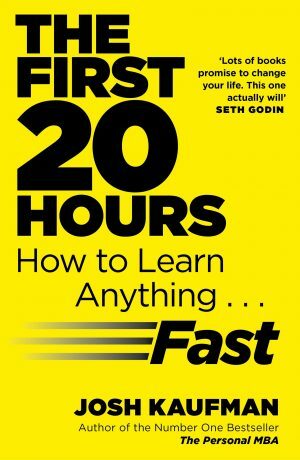 This week I picked up The First 20 Hours by Josh Kaufman. It’s a pretty solid introduction to the topic of mastering a skill. It introduces the key topics and terminology, provides a solid framework for quickly learning skills and busts a few myths along the way. As the name suggests, it’s focused on the first 20 hours of skill acquisition. Kaufman suggests that it’s often at around the 20-hour mark that the initial sense of being lost disappears. If you can stick it out for 20 hours, he reckons that you’ll start enjoying yourself and things will become easier. In some cases you’ll even reach your desired level of expertise in that time. It’s certainly true that the initial phase of skill acquisition is vital. If done right, you can develop your abilities incredibly rapidly — as Kaufman notes, a steep learning curve = a greater opportunity to learn quickly. If done wrong, you can get frustrated and quit. Kaufman introduces a couple of checklists that are very useful — the ten major principles of rapid skill acquisition and the principles of effective learning. Understanding and implementing these two checklists alone probably justifies the purchase of the book. Ultimately, Kaufman’s approach is to strategically plan his skill acquisition, removing potential barriers to putting in deliberate practice. He constantly reiterates how vital it is to just spend as much time practising as you can. Although simple, the message is really valuable — it goes against a lot of the habits that we develop at school or university. If you’re new to the theory behind skill acquisition, you’ll find that this book takes you right up the skill acquisition learning curve. 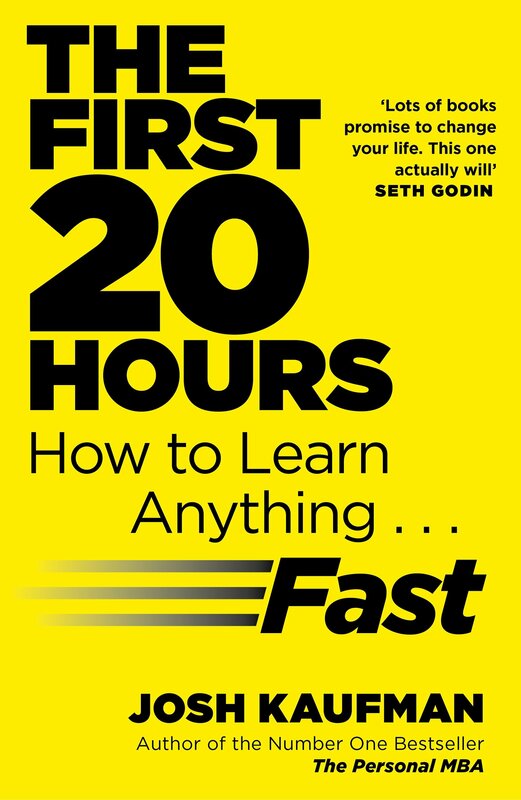 It gives you all the concepts you need to get through those first 20 hours as efficiently and effectively as possible. Even if you’re pretty familiar with the subject, I’d still recommend buying the book. It filled in some important gaps in my knowledge. I’ve also been reading Flow: The Psychology of Happiness by Mihaly Csikszentmihalyi. It’s totally fascinating. If you’re not familiar with the term ‘flow; it refers to the feeling of being totally absorbed in any activity, so much so that you feel “strong, alert, in effortless control, unselfconscious, and at the peak of [your] abilities”. I’ve been interested in flow for a while and wrote about it in my recent post on Lifehack. In my Lifehack post I talked about how flow can provide an almost unlimited source of long-term motivation. If you can implement it in your day-to-day life, even the most mundane of activities can become far more rewarding and therefore easier to stick to. I’ll be writing a lot more about flow in the future, starting with a post this Thursday. Make sure you like Find A Spark on Facebook to be sure that you don’t miss it. New post: Urges are waves. Let them break. On Friday I released a new post about dealing with urges when you’re trying to change a habit. It draws on some ideas from The Tibetan Book of Living and Dying and my own experiences with self-discipline and habit change. Urges are waves. Let them break. The BBC decided to release a new 3-part series on Thailand just in time for me to watch before I head over there in a week! I’ve watched the first episode which focuses on the south of Thailand. Expect ingenious crabs, birds with massive feet and some amazing bird farming. Definitely worth a watch. NPR’s Tiny Desk Concerts are awesome little live music sessions held at the NPR radio office. I’m currently addicted to Corinne Bailey Rae’s. I’m off to Thailand in a week. I’m not planning anything fully ahead of time but I’m looking for ideas and inspiration! Let me know in the comments if you’ve got any tips or recommendations! That’s it for this week. As I said last week, if you like this, please let me know! The simplest way is by liking the post on Facebook. The more likes my posts get, the more people Facebook decides to show them to. So it really does make a difference — I really appreciate it. Next up: Thursday’s post on Flow.